The Pygmy Lorikeet (Charmosyna wilhelminae) - also known as Wilhemina's Lorikeet - is endemic to the South-east New Guinea, Western New Guinea and East Huon Peninsula. It is listed as endangered (Cites II) in its natural habitat. The Pygmy Lorikeets are tiny birds, averaging 5 inches (13 cm) in length (including tail) and 0.7 ounces (20 grams) in weight. The male has a purple/brown crown and nape; the nape being streaked with blue. The hindneck has an olive wash and they have a red lower back. The rump is dark purple/blue and the breast is streaked with yellow. The underwing coverts are red. There is a red stripe under the wing. 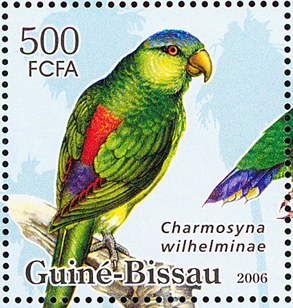 The tail is green tipped with yellow, with red at the base of side feathers. They have an orange bill and orange/red eyes. Females have green lower backs and underwing coverts. They lack the red underwing stripe of the males. Immature birds look like adults, but have little or no streaking on the breast or nape. Males have red underwing coverts and the red stripes under the wings - however, their lower back is purple. They have brown bills and eyes. Pygmy Lories are rare in captivity and therefore not inexpensive when they are available. It is best if they are placed into a well-managed breeding program with someone who is experienced caring for lories. These lories are sensitive to climatic extremes and changes and should be carefully acclimatized to local climate conditions (of course, that is simplified if a bird comes from a local breeder). It will need a heated shelter for the colder times of the year (especially in the northern areas). Due to their messy eating habits (that they share with all lories), strict hygiene is recommended to avoid disease situations. An enclosure with a well-drained floor, suspended over concrete base, or a planted aviary (minimum dimensions: 4 ft / 1.2m long) is recommended. If they are kept indoors, easy-to-clean tiles are the best choice for both the floor and walls. If you can, provide bird-safe / untreated branches with blossoms so the lories may benefit from the natural pollen and nectar. Shallow dishes for daily bathing should be made available. Its mainly "sticky" diet make it especially important for this parrot to be able to wash any sugary liquids off its plumage. The average clutch size may consist of 2 eggs that are incubated for about 23 days. The young fledge when they are about 7 weeks old. The Pygmy Lorikeets are generally considered to be very quiet. They do have high-pitched calls, less shrill than that of other lorikeets, but still irritating to some individuals. Their voice ranges from loud, piercing whistles and metallic "pings" to soft, high-pitched warbles and chattering.